Aspen alkylate petrol is an extremely clean and effective motor fuel which, compared to regular pump fuel, is virtually free from benzene, sulphur or other harmful substances. The actual alkylation process to produce Aspen is a much more advanced and expensive process. 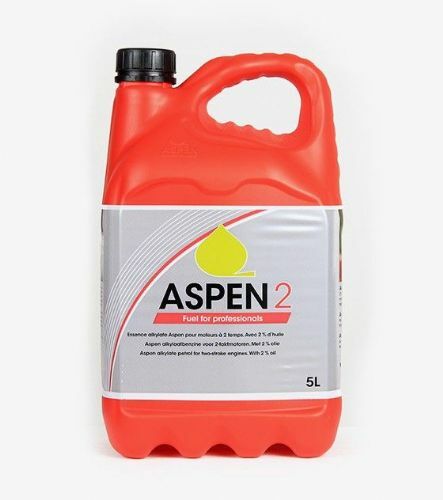 Aspen 2: Aspen 2 contains a 50:1 mix of fully synthetic oil and is suitable for machines such as chainsaws, strimmers, hedge trimmers and other air cooled 2-stroke engines. Aspen 4: Aspen 4 is alkylate petrol without any added oil and is suitable for machines such as lawnmowers, stump grinders and other 4-stroke powered machines.